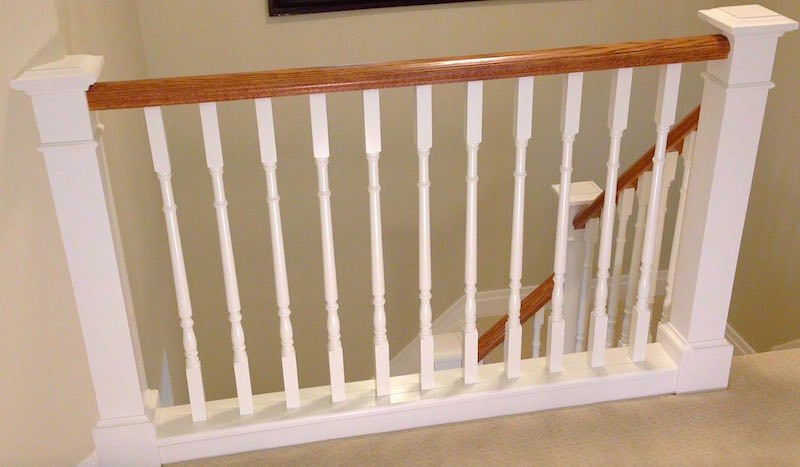 Stair spindles, also known as balusters, fill in the space between the handrail and the floor to prevent people from falling through. These need to be strong and secure. 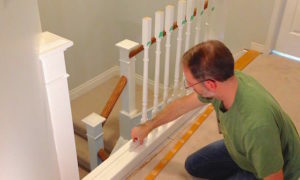 I began the installation of the spindles on horizontal section of the staircase first before moving on to installing the stair spindles on angles. 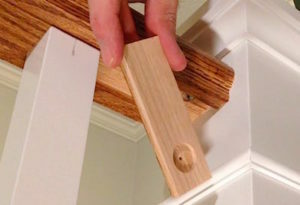 By using the fillet strip from the old railing, I was able to determine the space needed between each spindle. Once the space between each spindle was set, I held the handrail in place to determine the spindle height. With these measurements set, I cut the spindles to length and cut the bottom fillet strips. To begin the installation I did a dry fit to ensure everything would work out as planned before adding glue. 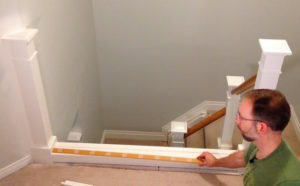 I began with the starter fillet strip first which is placed in the shoerail beside the newel post. To understand how to make a shoerail, see the our shoerail video. I then stood up the first spindle in the shoe rail. After that, the next fillet strip is put in the shoerail and the second spindle is put in place. 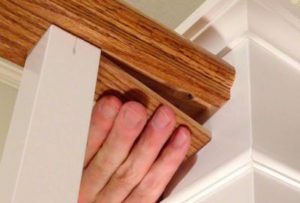 Once all the fillet strips and spindles were put in the shoe rail, I trimmed the end fillet strips to ensure a tight fit. I then took it all apart, added glue, and put it together again. Next, I cut the top fillet strip the distance from the outer spindles and screwed it in the top of the spindles using pilot holes and screws. 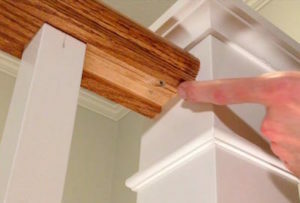 I need the space for fillet strips between the last spindles and the newel posts to conceal screws in the handrail. Now it is all one solid piece with the fillet attached to the secured spindles. I cut the handrail to length and fit it on top of the spindles and fillet strip. I then screwed the handrail to the newel posts from underneath with pilot holes and screws. Finally I cut small pieces of fillet strips to conceal the screws. Because the screw heads were protruding, I drilled a shallow hole where the screw head is so it won’t interfere with getting a tight fit. I added some glue and clamped it in place. 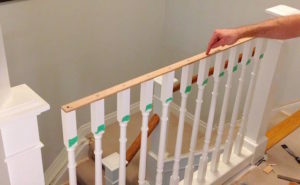 This was the first stage of installing the spindles/balusters in this staircase renovation. In the next stage of this renovation, we install the stair spindles on angles.